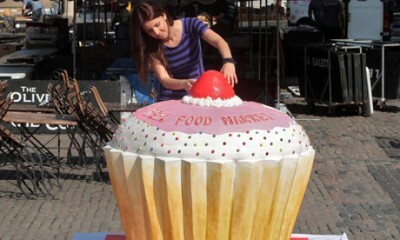 Battle for the Largest Cupcakes Record! By harrisonca on July 17th, 2009 . Filed under: Announcements, Bakeries, Contests, News . Ladies and gentlemen, behold! The mother of all cupcakes. Measuring 1.25 m by 1.2 m (4.1 feet by 3.9 feet) and weighing in at 150kg (330 pounds). This cupcake was painstakingly baked and assembled with 50 hours worth of labor by Michelle Wibowo from Michellcakes.co.uk. Although this cake is a wonder to behold, I can’t imagine it being a wonder to taste! 50 hours of assembly can ruin the moistness and texture of any cupcake. More details about the event and opinions about the cupcake at the guardian.co.uk. Following on the heels of this British story, an announcement by the Mall of America that they will be displaying a 100 lb cupcake with judges from Guinesss book of world records. A mere 1/3 of its British counterpart in weight and size, this US cupcake seems poised to officially take the record. It has already been announced that after the showing at the Mall of America, this 100 lb cupcake, all 131,000 calories, will be shipped to a local hog farm for consumption and digestion. I have been informed from Sarah Voigt that this plus-sized cupcake will be presented on a tower that will hold 2,500 regular cupcakes. Additionally, 4,000 FREE cupcakes will be given away during the 10th anniversary celebration of SpongeBob Squarepants. If I were in the area, I would make some time to check out this fun spectacle.